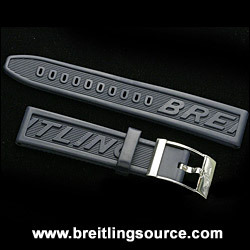 The Breitling diver pro rubber strap is availabe in many sizes and colors. The most common are black and blue, and the strap is a popular option for the SuperOcean line of watches. It is however often seen on other watches in the Aeromarine and Professional line such as the Emergency or Avenger Seawolf.